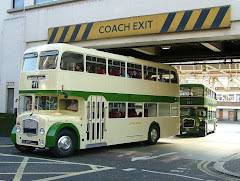 This week was a chance opportunity to take a picture of two early batch RMLs together at the BusWorks - RML885 & RML887. The first is being returned to owner Mike Mitchell after some remedial work to paintwork on the crown of the roof whereas this maybe the last opportunity to see RML887 in GENERAL livery. RML887 will soon receive an all-over advert for a national advertising campaign and will be touring the country in January so adorned. After that, it will be repainted in traditional London red to join our wedding hire fleet.